Okay, I copped that infamous line from at least a dozen, if not more episodes of Sea Hunt. It was worth it. It happened, alright. It surely happened (and don’t call me Shirley). If I need to tell you where I copped that line, well you aren’t no movie buff! Anyway, I had my first solo book signing and at the risk of repeating myself, it was well worth it! My solo event was organized by Barnes & Noble. The idea was to get as many people as possible to show up. The store pre-ordered a certain number of books, on the condition that my publisher accepts returns. That’s the big condition of a major retailer doing a book signing. Either you have to supply them the books, so they can sell them through their cash register at the retail price, which they don’t like to do because it isn’t in their system (more on that in a moment), or they order them from their supplier who accepts returns. It’s not that retailers are so much against self-published books. However, when you self-publish, you have no distribution system. A large retailer deals with stock systems and distribution. This means inventory and returns etc. When you try to bring them something outside the system, it plays havoc with their books. In that regard, they just simply don’t like to deal with it. In my case, since I did NOT self-publish, my book’s available through Ingram and Baker & Taylor distribution systems. Not only that, but it’s available through Barnes & Noble. At first, there was a glitch and it was cataloged wrong, but that was straightened out. When I got that cleared, the very nice lady in charge of things said yes to the book signing. The difference between a small publisher and a large one is distribution. Because my publisher is not one of the top five, my book isn’t distributed to all the stores across the country. In that case, this local store ordered that set quantity for the book signing, on the guarantee the publisher would accept the returns. With that taken care of, it was a matter of pre-publicity. Though Barnes & Noble posted the event on their web site, it was up to me to do my own marketing as well. I learned a few things. First off, social media was by far, the best way to get the word out under these circumstances. I used Facebook and Twitter, even though 99.9% of my Twitter followers (1K+) don’t even live in Las Vegas. On the other hand, I had some mailers and flyers printed. As for the flyers, I deliberately had them printed 5X7 because I figured the larger they are, the more likely someone would take them down from a bulletin board. The smaller size was more likely to stay up longer, even if they were smaller and drew less attention. Have you noticed that almost nobody has bulletin boards anymore? I found that out the hard way! I went all over the place and found almost NO bulletin boards! When I did, I usually got “It can’t be for any money making event.” Say what??? Shot down in flames. I have a pack full of useless flyers and mailers. Oh yeah, about the mailers, I ended up just giving them to people that I either see all the time, or are already Facebook friends. The day of the event was tight. Since it was a Saturday, I unfortunately, usually have something going on with my astronomy club as well, and quite often miss my other writer’s group member’s book signings. I couldn’t very well miss my own! Right after this event, I had to rush home, pack my telescope and head to the north end of town for a public viewing session. 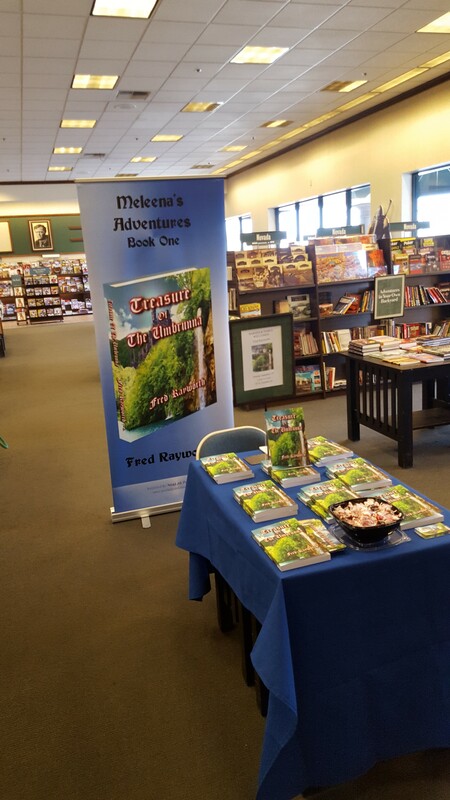 Anyway…I arrived at the store and they already had a table set up for me to the right of the main door, with my books displayed and a sign with a photo of my book. They also had a display screen with my book and name as you walk through that door above their Kindle display. I brought my fold-out banner, my bookmarks and business cards. I also brought a note pad to write down complicated names for signings. I always do that in case someone has an unusual spelling of their name so I get it right, or if someone speaks softly or in a tone I can’t hear very well. Finally, a key component, to attract extra attention and for a conversation starter, I added a candy bowl. The store ordered fifteen books. The event went very well. The key to a book signing, now this is important, is to NOT sit at your chair (which they supplied) and just stare forward. Remember, you’re there to sell books, not wait for people to come and discover you! Okay, right about where I’m standing, except I was on the other side of the table, is where I stood the entire two hours. I sat three times for about thirty seconds to rest my legs during lulls. When anyone came through that main door, which was to the right as seen in the photo, I stood and greeted people as they came through the door. Some people avoided eye contact. I still said hi. Sometimes they responded, sometimes not. There are certain people you just know not to mess with. Some people are just shy and if you say hi and start talking to them, they respond. Some people if you say something, you can start a conversation. Don’t be afraid to be rejected. Most will, but once in a while, someone will spark an interest. The candy bowl was a great conversation starter. Sometimes it was just an avenue for kids. Sometimes adults with a sweet tooth. It made people hesitate. I said hi to a lot of people. I found a lot of people didn’t read fantasy, but a few did as well. I explained the book to many. Some showed interest. Quite a few took my business cards and bookmarks, both which have the book title, ISBN and/or my web site. As a result of my publicity, four people I know stopped by. Three bought a copy of the book. One stranger bought a copy as well. I went with no expectations. My goal was to sell at least one, so I outdid my expectations and then some! That may not sound like much to some of you. 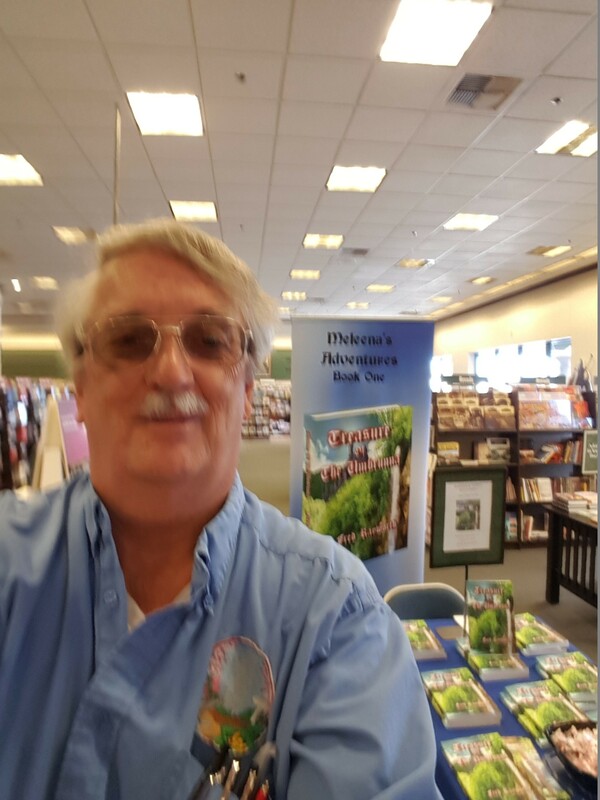 However, consider how many book signings virtual unknown authors or even some very well-known authors go to where they don’t sell ANY books! Oh…and I also got a maybe from one person who had to leave and catch a ride. We’ll see about that one. In the end, the store asked me to autograph six copies of the book. The put “autographed by author” stickers on them and set all of the remaining books on a table by the door for a few days before transferring them to the local author wall in the back of the store. I’ve been posting that on Facebook to let everyone know. Maybe some of those will eventually sell as well. Folks, this is the life of a new author. Unless you’re up there on the New York Times Best Seller List, get used to it. You’ll be doing the same things. I love those kind of posts, it gets me imagining when it will happen to me the same thing(hopefully). I really appreciate that! I just joined your site as well.